This is an all time favorite recipe that is as simple as it is DELISH! I made it for my family's Quailapalooza holiday gift exchange and there wasn't a meatball left to be had by the end of the night! Will, especially, became an immediate fan. Glad you liked them, Will! Serve these at your next party and I PROMISE your guests will devour them!! In a large bowl, combine ground beef, bread crumbs, onion, milk, egg, salt, Worcestershire sauce, and ground black pepper. Mix together, and shape into meatballs. In a large skillet, heat shortening over medium heat. 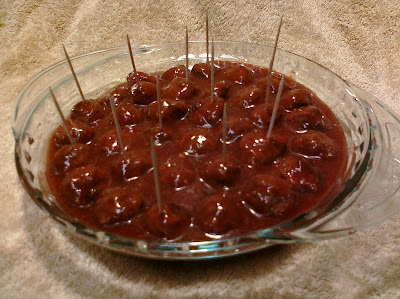 Add meatballs, and cook until browned, about 5 to 7 minutes. Remove from skillet, and drain on paper towels. Pour off any shortening. Add chili sauce and jelly to skillet; heat, stirring, until jelly is melted. Return meatballs to skillet, and stir until coated. Reduce heat to low. Simmer, uncovered, for 30 minutes. Keep them warm during your party in a crock pot, if desired. Instead of frying them, I placed them on a baking sheet and baked them at 350F for about 20 minutes. It's a lot faster than standing at a stove frying meatballs for a million years. I used a tablespoon to measure each meatball as I rolled them. It helps to insure that all of your meatballs will be the same walnut size. If you're feeding a crowd, just double or triple the recipe (or as many times as needed). Instead of cooking the sauce with the meatballs in a skillet, I just heated the sauce in a pot until the jelly was melted and the sauce was smooth. Then I placed everything in a crock for a few hours until it was time to go to the party. The sauce makes quite a bit, so feel free to cut the amounts in half. If you find yourself with a lot of leftover sauce, it would be wonderful to pour over a meatloaf. Or just make more meatballs!